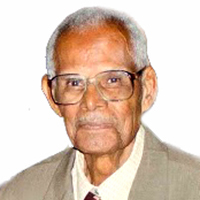 The Political Leader, Dr. Keith Mitchell and other members of the New National Party are saddened to learn of the passing of Sir John Augustus Watts, KCMG, yesterday, 11 May 2015. Sir John was a founding member of the New National Party and a tour de force who left a lasting impression not only on the political landscape of Grenada but in the many other fields he served so well – including dentistry, Rotary Club activities and tourism to name but a few. He served his beloved country with distinction, strength of character and integrity, whether as a practicing doctor, Party Chairman, President of the Senate, founding member of the Grenada Rotary Club, or founding member of the Grenada Hotel and Tourism Association. In politics, Sir John is credited with helping to shape the progressive and vibrant Party we see today, and to the very end, he shared his great wisdom and vast experience with all members of the New National Party. In November, 2014, in the celebrations of the 30th Anniversary of the New National Party, Sir John received a special award in recognition of his outstanding services rendered to the Party for over thirty years. This was just one of numerous awards presented to Sir John over his long and illustrious career. The New National Party extends its deepest sympathies to Sir John’s family and all those who knew and loved him – Sir John, you will be dearly missed.